On paper, Jorge Lorenzo’s journey to the title looked like a doddle. He had seven victories to title rival Valentino Rossi’s four and he claimed five pole positions to Rossi’s one. 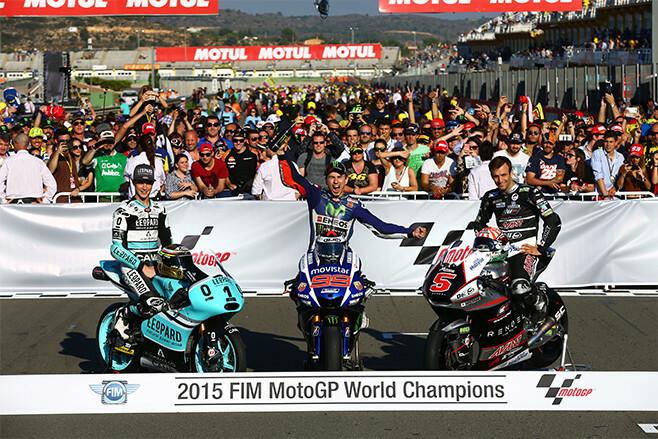 But of the 448 laps of MotoGP racing in 2015, Jorge Lorenzo was leading the race in 274 of them. Valentino Rossi, who led the championship standings after every single round except the one that mattered, only spent 50 of the 448 laps in first place. But in reality, Jorge Lorenzo’s championship was one of the hardest fought in recent times. Unfortunately for Lorenzo it mostly came down to bad luck. Bad luck hovered over the fiercely focused Spaniard all season serving him many circumstantial curly ones out of his control. If it wasn’t various helmet issues hindering his vision (Qatar and Silverstone), it was illness (Argentina). He crashed out of the San Marino Grand Prix and suffered severe tyre degradation in Motegi. But his steely focus paid dividends. While many would have conceded Valentino Rossi to be more than capable of managing an 18-point lead with three races to go, Lorenzo never took his eyes off the prize and another something out of his control went and happened. Valentino Rossi got a little greedy. A small decision to serve out some oh-so familiar mind games snowballed into a feral old fiasco that played straight into Lorenzo’s hands. And it ultimately handed him the title that few could argue he didn’t wholeheartedly deserve. If Lorenzo’s win was a culmination of spectacle and scandal, Moto2 world champion Johann Zarco’s title claim happened without many people even realising. You see, the Frenchman was crowned world champion after a free practice session on the Friday leading up to the Japanese Grand Prix. Zarco had a 78-point lead over title rival Tito Rabat heading into Motegi, who by then was the only bloke capable of quashing Johann’s hopes of being crowned world champ with four rounds to go. Thing was, Rabat rocked up with a broken arm. He did his best to grit his teeth and ride through the pain but it was fruitless. Rabat withdrew from the race and in doing so handed Zarco the title in what was a spectacularly anti-climactic world championship win. Which isn’t to say he didn’t deserve it. He did it with eight victories, 14 podiums (which equals Marc Marquez’ record for most podiums in a single season in the intermediate class), seven pole positions and with a swag of impressive celebratory backflips. He lead 150 of the 383 race laps this season and finished the season with a 118-point buffer over Alex Rins and Tito Rabat who were separated by just three. But unlike his title rivals, Johann Zarco started and finished every round of the 2015 Moto2 world title. His consistency and results in 2015 sees Johann Zarco with the record of the French rider with the most grand prix victories in a single season. Danny Kent had a remarkably successful first half of the 2015 Moto3 season. In a class famous for close racing on relatively equal machinery, it wasn’t unusual for the 21-year-old Briton to streak to victory with a nine- or 10-second margin. So by the ninth round of the season, Kent had a 66-point buffer over Enea Bastianini in the title chase with eight podiums from nine attempts, five of which were victories. This kid was making it look easy. Perhaps it was the pressure of looking capable of becoming Britain’s first grand prix world champion in any class since Barry Sheene some 38 years prior, but Kent’s luck began to change. The following round at Indianapolis inclement weather and poor tyre choice saw the Brit finish out of the points in 21st place. Two rounds later he’d win his home race at Silverstone but it would be the only other time Kent would stand on the podium for the rest of the season. His first opportunity to be crowned world champion came in Japan. It was a slim chance and one which his seventh-place finish failed to present to him. He had another chance in Australia but he and Bastianini both crashed out of the race which meant by the time he got to Sepang, Miguel Oliveira was the only bloke able to come between him and the world title. But it eluded him yet again. He finished seventh as Oliveira won and viewers around the world were seeing more and more shots a worried and stricken Danny Kent’s mum. The two points needed to win the title in the last round of the season would have sounded like a walk in the park in the first half of the season. As Miguel Oliveira secured his third consecutive grand prix win all eyes were on the number 52 to see where he’d cross the line and if he would be Britain’s first world champion in 38 years. And his ninth place finish was just enough.